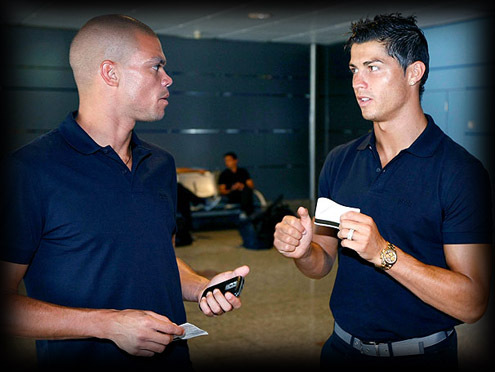 18.05.2011 » Pepe: "The goal against Real Sociedad was from Cristiano Ronaldo"
Pepe decided it was time to speak about the controversy goal scored against Real Sociedad. Pepe has no doubts and says that the goal belongs to Cristiano Ronaldo and therefore, CR7 should now have 39 and not 38 goals. In the last days there has been much talking about the exact number of goals that Cristiano Ronaldo scored this season. As we reported previously in several articles, there's the official record from the Spanish League "La Liga" Federation which says that Cristiano Ronaldo has 38 goals and in the other hand, Marca.com, the ones responsible to deliver the Pichichi award, state that Cristiano Ronaldo has 39 goals. That 1 goal difference is because of the goal Real Madrid scored against Real Sociedad in the "Anoeta" stadium, in the 18th of September of 2010, counting for the 3rd fixture of the Spanish League. Cristiano Ronaldo took a free-kick and the ball got deflected on Pepe's back, before ending on the back of the net. La Liga official match report says that the goal belongs to Pepe and Marca.com awarded it to CR7. You can watch Juventus live stream, that Cristiano Ronaldo goal vs Real Sociedad here. It's the number 1 of the list. Since Pepe was the one being awarded with that goal, he felt it was time to talk about it to the press and explain he didn't deflect the ball intentionally and, therefore, the goal should be accounted to Cristiano Ronaldo. It won't make much difference in terms of knowing who will win the Pichichi this season, because Lionel Messi has 31 goals and CR7 has 39 or 38 goals, with 1 game left. However, it may be even more controversial if Cristiano Ronaldo doesn't score any goal against Almeria, because many people would then say that CR7 didn't exactly break Hugo Sanchez and Telmo Zarra's 38 goal record, according to La Liga's statements, while Marca.com official position will keep indicating that the Portuguese player scored 39 goals and, therefore, broke all records. Pepe: "Whatever the official match reports says, that goal was from Cristiano Ronaldo. The ball deflected on me and got in, but it was not intentional and the merit is all his, because he's the one who took the freekick. We talked with each other about that goal and there is absolutely no problem at all in recognizing the goal belongs to Cristiano Ronaldo." Pepe also commented about the controversial moment where he got sent off with a direct red card, in the match against Barcelona, for the UEFA Champions League semi-finals. Pepe: "I didn't touch Daniel Alves and everbody can see that. We could have gone through to the final, but we were not depending exclusively on us. Barcelona searched for a way to get rid of me and then they did their job. That red card changed everything. In the Spanish League, Messi scored us from the penalty spot, but in the Copa del Rey he didn't do much..."